With a lot of noise around smartphones with curved displays, Samsung has filed yet another patent for a curved display but this time with a wraparound display. 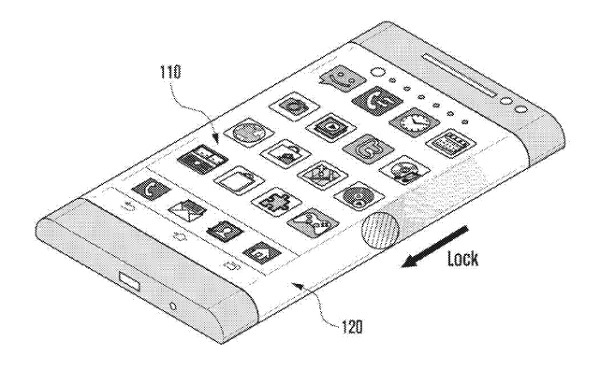 According to a new patent filing seen at the USPTO, Samsung seems to be working on a wraparound touchscreen. The filing is titled as “Method and apparatus for operating functions of portable terminal having bended display”. With a bendable display like this, Samsung would able to use virtual buttons and faders which would easily eliminate all physical buttons from the device. Sources claim that Samsung would release a Galaxy smartphone in 2014 with this wraparound display and would use the same Youm display technology used in the Galaxy Round. What makes the wraparound display interesting is the fact that all the three sides of the display would function independently of each other. We can expect the smartphone to be part of the Galaxy S or Note range.